Aldi UK has launched a hilarious new advert, highlighting that choosing your loyalties can be a dangerous game, but not when it comes to toilet roll, and encouraging you to make the swap to Aldi in order to save money on a wide range of home essentials every week. The 30-second spot, inspired by HBO’s hit series Game of Thrones and dubbed “Game on Thrones,” is set against a wild natural landscape and features two long-haired, bearded middle-aged men looking into each other’s eyes. 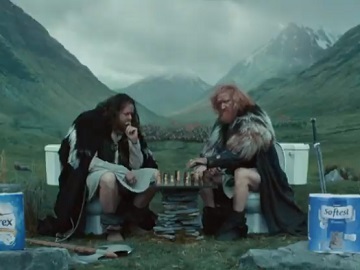 As the camera pans, it turns out that they are playing a game of chess while sitting on toilets. “We like these, and we like these,” one of the men says referring to Andrex toilet rolls (available at Morrisons for £5.25 per 9 pack) and Saxon toilet rolls (available at Aldi for £2.79 per 9 pack). Soon after, a fire apparently thrown by a dragon burns everything around them, which makes the same man add that they don’t like that. The advert also specifies that a comparison of products is shown only and that Morrisons may sell “own brand” products at different prices. The prices listed on screen were checked on Morrisons website on 10/04/2019. Aldi has been using this approach in its advertising campaign to promote also other products including wine, air fresheners, and more. One of the previous spots, for instance, features a couple who use a room spray from Aldi (cheaper with respect to one sold at Asda) to make the bad smell caused by their dog to disappear.